About dawn on the morning of June 25, 1876 , George A. Custer, accompanied by his interpreter, Fred Gerard and his Arikara Scouts, Little Brave, Bloody Knife, Bob-Tailed Bull and Red Star, rode to a ridge called the “Crow's Nest” to view the Valley of the Little Big Horn below. Earlier that morning Red Star and other Crow Scouts had spotted the hostile Sioux and Cheyenne camp from this vantage point. By the time Custer arrived there, the haze from the morning sun had obscured the view but believing his scouts decided to attack as soon as possible. By the time this days sun would set, Lieutenant Colonel G.A. 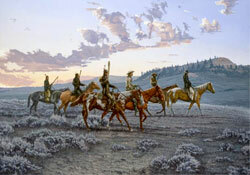 Custer along with approximately 250 officers and men and the Arikara Scouts: Bloody Knife, Bob-Tailed Bull and Little Brave depicted in this painting would not see another sunrise. Exclusive issue of only 50 signed and numbered Giclee canvas prints. Image size 36” X 24” and comes unframed on stretcher bars. The price is $500.00 plus $70.00 shipping. $450.00 for the unframed paper print. Please ask about our custome framing. Please order online, E-mail or call us 307-868-2111.